Alexandria became the capital of the Greco-Roman Egypt, its status as a beacon of culture symbolized by Pharos and the setting for the stormy relationship between Cleopatra and Mark Anthony. The city, immortalizing Alexander's name, flourished, beyond all expectations, into a prominent cultural, intellectual and economic metropolis, the remains of which are still evident to this day. The principal objective of reviving the Bibliotheca Alexandrina is to establish a comprehensive research library of a unique collection and intention. The new library is designed as a modem state-of-art translation of the old, adequate for crossing the frontiers and meeting the challenges of the 21st. century. It will certainly contribute to excellence in research and advancement of human knowledge. The library will become a unique admired research institution, a haven for scholars worldwide to produce their quality work of excellence. It will also be an invaluable information resource to support decision-making and broaden future horizons for the cultural, social and economic development of Egypt and the region. Subsequently, the library will play a needed role to further cooperation between the north and south of the Mediterranean Basin. As well as between the east and west. The Bibliotheca Alexandrina has adopted its collection development policy in cooperation with UNDPIUNESCO and with valuable input of national and international experts, in order to evolve its unique collection and functions and to avoid repetition and unnecessary overlapping with other research libraries regionally or internationally. 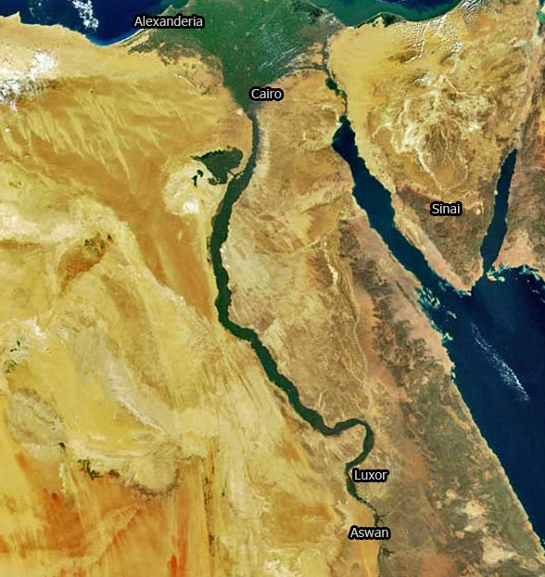 Since the famous 1990 Aswan Declaration, UNESCO and the international community has been cooperating with the Egyptian Government to muster resources for the library implementation. The new Bibliotheca Alexandrina has a site of 45 000m2 located in the center of Alexandria across from the Silsilah Peninsula. This is the location of the ancient “Royal Quarter”, where the first library is thought to have been located. The Corniche waterfront avenue and the sea bound the library site from the north for a length of 305m giving the Library a magnificent view of the Eastern Harbor. Also, on the site, is the Conference Center of Alexandria, 5000 m2, which will augment the facilities of the library. The Bibliotheca Alexandrina is located on a magnificent site in the Eastern Harbor, facing the sea on the north, and Alexandria University Complex on its southern side. It overlooks the Silsilah Peninsula. It is very close to the location of the Old Library in the Brucheion (the Ancient Royal Quarter), as verified by the 1993 archeological survey. The Library of Alexandria complex includes: the Main Library, Young Peoples' Library, Library for the Blind, Planetarium, Science Museum, Calligraphy Museum, Alexandria Archeological Museum, International School of Information Studies (ISIS), Conservation and Restoration Laboratory, Conference Center of Alexandria and Ancillary Services, Multipurpose Rooms and Exhibition areas. Houses many collections of rare Roman relics and coins- about 40 thousand pieces, from the 3rd century B.C. to the 7th century A.D. The most important being the " Tanafra" statues. These Limestone tombs, dating from about 250B.C. are decorated with pictures of Egyptian gods and daily life. 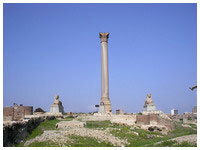 It lies at the northern tip of eastern harbor, on the site where Pharos of Alexandria stood. 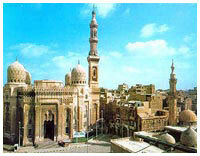 It was constructed in the 15th century by Qaitbay and consisits of 3 floors. Established in Fatma El Zahraa Palace, Alexandria – Zezenia District. It is considered a magnificent architectural piece of art; its halls comprise several paintings, decorations and restates. The Museum houses collection of Mohamed’s Ali Family’s jewelry. Acres of formal gardens and a beautiful beach make Montazah (shown to the right) the foremost city pleasure grounds. Montazah Palace, a grand structure built in a mixture of Turkish and Florentine styles, is now a great statehouse. This is the largest Roman cemetery. It is of three levels and cut in the rock to a depth of 100 feet. Dating to the beginning of the 2nd century A.D., it is a blend of Pharaonic and Roman art. This is a granite pillar, over 25 meters high, and built amidst the ruins of the Serapium in 297 A.D., in honor of Emperor Diocletian. Situated at El Anfoushi, it is one of the most important Islamic monuments in Alexandria with its high minaret and four domes.